, a distinguished lawyer, is said to have been born at Easton Mauduit, in Northamptonshire, June 29, 1566, but as the register of his baptism, July 5, of that year, occurs at Islington, it is more likely that he was born there, where his father, sir Christopher (then Mr. Yelverton, and a student at Gray’s Inn) had, it is probable, country lodgings. 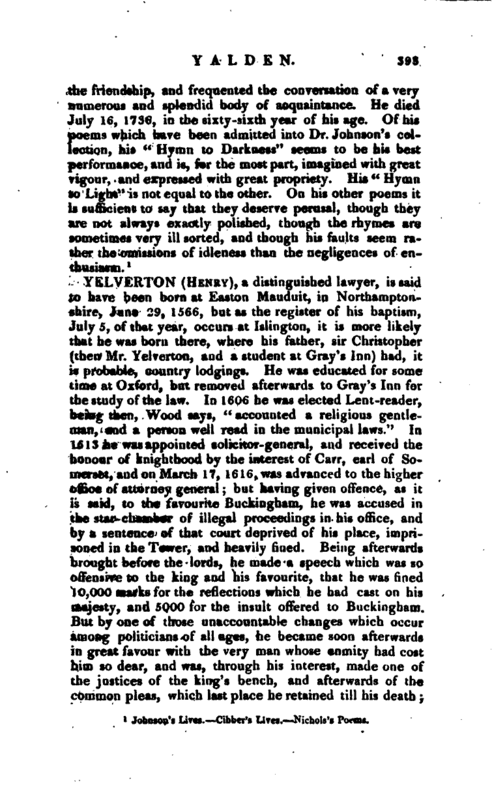 He was educated for some time at Oxford, but removed afterwards to Gray’s Inn for the study of the law. In 1606 he was elected Lent-reader, being then, Wood says, “accounted a religious gentleman, and a person well read in the municipal laws.” In 1613 he wasappointed solicitor-general, and received the honour of knighthood by the interest of Carr, earl of Somerset, and on March 17, 1616, was advanced to the higher office of attorney general; but having given offence, as it is said, to the favourite Buckingham, he was accused in the star-chamber of illegal proceedings in his office, and by a sentence of that court deprived of his place, imprisoned in the Tower, and heavily fined. Being afterwards brought before the lords, he made a speech which was so offensive to the king and his favourite, that he was fined 10.000 marks for the reflections which he had cast on his majesty, and 5000 for the insult offered to Buckingham. But by one of those unaccountable changes which occur among politicians of all ages, he became soon afterwards in great favour with the very man whose enmity had cost him so dear, and was, through his interest, made one of the justices of the king’s bench, and afterwards of the common pleas, which last place he retained till his death; | and had not the duke been untimely cut off, he would in all probability have been made lord-keeper of the great seal, as he was esteemed one of the first lawyers of his time. He died Jan. 24, 1630, at his house in Aldersgate-street, and was interred in the parish church of Easton Mauduit. Ath. Ox. vol. 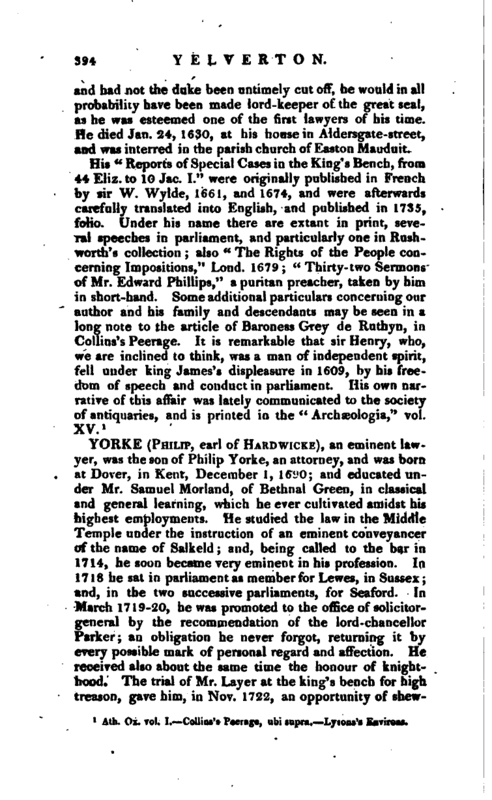 I.- Collins’s Peerage, ubi supra. Lysons’s Environs.